Between his teenage and this decisive departure were spent many years of quest and attempts of all sorts that made him « grow and shrink ». These were motivated only by the hope of finding a daily occupation that would bring all-in-one professional, spiritual and financial satisfaction, and the childish wonder that he says he can never quench the thirst for. Those years were thus spent on studies in the field of professional photography, followed by various related and non-related jobs, and then studies in the field of business. It was in 2002 that several unrelated events made him decide to buy an airplane ticket for Western Japan. In lieu of preparation, 1000$ in cash, a 500$ student credit card and a friend’s family who would host him for a month. That same night, at a guesthouse in the area, he had asked a friend to search the area for a traditional swordsmith, without actually believing that there were still any alive. In fact, not only did they find one, but the craftsman invited them to visit him the next day. Pierre visited him several times, by curiosity for the craft, but also to learn more about the daily reality of present-day swordsmiths in the 21st Century. In August 2003, he returned to Canada after a one-year stay well filled with adventures of all sorts, of which the average was rather positive. Then came the second stay, officially as a tourist that time, during the 2004 summer. He had come to meet with several smiths, simply asking for a talk. « One does not knock on a stranger’s door and ask to be accepted as an apprentice! It’d be like proposing to wed the first stranger met on the street. The master-apprentice relationship never ends, and the master is responsible towards those to who he passes down the tradition. » He meets with Yoshihara Yoshindo (co-author of The Crafts of the Japanese Sword, Kapp, 1987, Kodansha) in Tokyo, Kojima Hiroshi in Saitama, Gassan Sadatoshi in Nara, then a second time with Kawachi Kunihira at the time of an exhibition, and then again Kiyota several times. 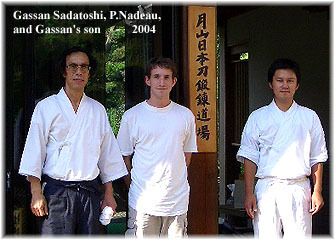 Pierre then returned to Canada to complete his degree and moved back to Japan in December 2005 in order to start his apprenticeship under Kiyota. « The first year was a surprise in that it didn’t require of me any of what Westerners usually believe to be a japanese apprenticeship’s sacrifices. Kiyota tends to be very down to Earth and didn’t consider himself anyone’s Master. » Pierre happened to be studying with him, as he often said, but the relationship was nonetheless very straightfoward, and Kiyota’s expectations in terms of work quality were clearly demonstrative of his own training. As time passed, however, the pace seemed to never pick up, and Pierre realized that many apprentices in the modern age go through five years of training without virtually touching a hammer! It was expected to be different in the Kawachi Kunihira Ichi-mon, Kiyota’s group of swordsmiths, but Kiyota himself chose to lead a slow life and work when he pleased. 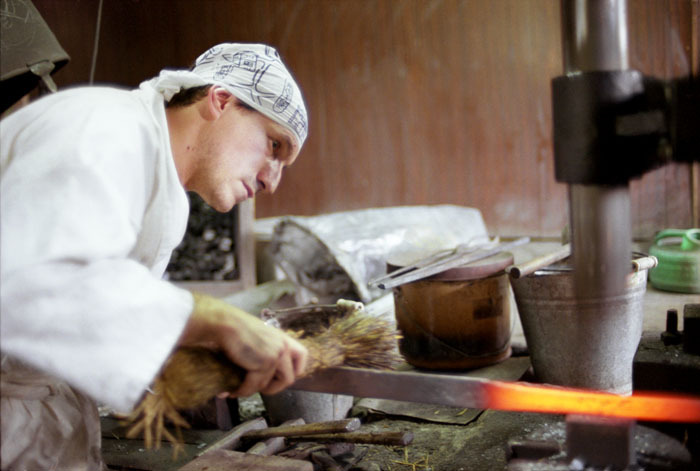 In 2008, Kiyota stopped working altogether, not finding satisfaction in a swordsmith’s life. 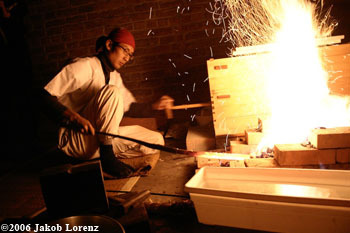 In the spring of 2009, Pierre tentatively entered apprenticeship under Kiyota’s own master, Kawachi Kunihira, as a live-in apprentice for a very brief period. The pace at Kawachi, the working environment and the Kawachis’ highly dedicated teaching were all very positive, but having to live and pay the apprentice’s room and board charge without any revenue for another two to four years simply did not add up. 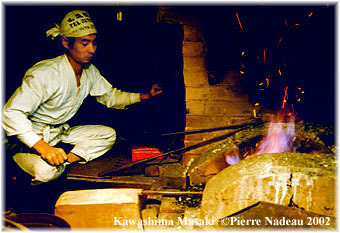 But things got better after that when Pierre was given blacksmithing tools, and decided to rent the 100 year-old village smithy where Kiyota used to work. He sustained himself through different jobs on the week-end and pursued practice under Manabe Sumihira on weekdays. 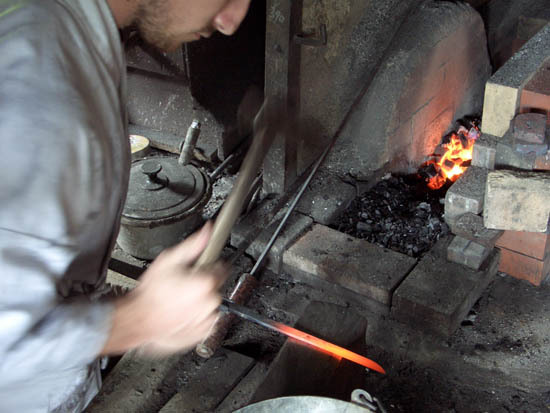 In 2011, out of money and options, Pierre decided to move back to Canada where he was offered an opportunity to set up his smithy and be paid to manage an NPO dedicated to preserving blacksmithing. This did not work out as planned, and Pierre soon found himself out of a place to set up shop. He finally purchased an old shack in the countryside in 2013 and the smithy is to be built during the summer of 2015, finally getting back to blacksmithing almost four years after leaving Japan. 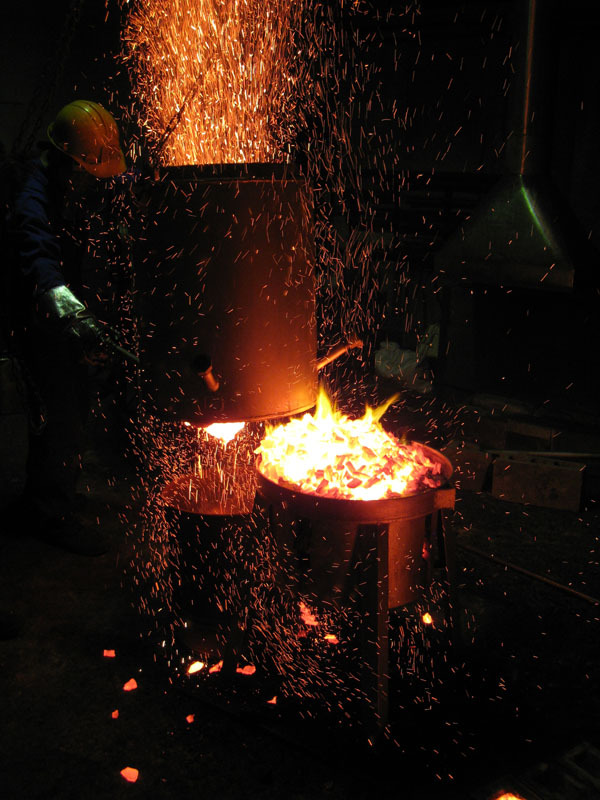 During his time in Canada, Pierre built his own tatara iron-smelting furnace as designed my Mr.Mori, a DIYer who taught Gassan, Kawachi, Ezumi, Manabe and many more how to smelt iron ore in the 1980’s. The ore found in Canada wasn’t conclusive so far for its mother stone won’t melt at lower temperatures, forbidding the formation of a liquid slag. Research goes on and will pick up with the new smithy.